We deal in high precision Reinforced Suction Hoses in the domestic and overseas market. Our PVC Steel Wire Reinforced Suction Hoses are used in different industrial as well as engineering applications. These reinforced suction hoses are manufactured from the optimal raw materials rendering them extra durability and endurance. Our Reinforced Suction Hoses are tested on different yardsticks before they are supplied in the market. Apart from that, we are considered as one of the leading PVC Flexible Reinforced Suction Hoses Manufacturers in India. Treadle Pump for Irrigation : Weather resistance and durability makes it perfect for withstanding the vacuum pressure and stress of irrigation use. Construction : Light weight and flexibility combine with durability to make it ideal for all construction applications. Its ability to withstand crushing it particularly valuable. Toughness makes it suitable for conveying mixed concrete at construction site. Marine : Resistance to Sun weather and salt water helps it withstand severe marine service ease of handling and light weight are important features during foul weather. Sump Pumping : Resistance to abrasion, mild acids and alkalis results in superior service in industrial application using sump pumps. Sanitation : Crush resistance, light weight and flexibility result in top performance for septic tank cleaning services. Cutable into any desired length. All hoses are calibrated internally (with a tolerance of +-2£). All Technical data are subject to +-5% tolerance. Specifications are subject to change without prior notice. Available in standard length coils to 10/30/45/50 meters. Also available in 6 & 7.5 meters length. Rolls wrapped in plastic sheet and Hessian cloth. 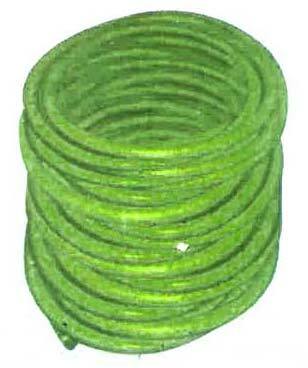 Lay coils flat in shade, in height not exceeding 1.5 meters and rotate stocks every two months.